Recently, Iris from The Daily Dietribe contacted me asking me if I’d like to make a grain-free version of a recipe she was working on for a reader. It also happened to be a vegan recipe. A vegan baked recipe. Grain-free and vegan and baked? That’s a challenge. But, I was willing to give it a go. The majority of this recipe is really Iris’. To make it grain-free, I reduced the liquid a little, swapped out the grain-based flour, and amped up the vanilla. Mostly, I added extra vanilla because there’s a tipping point for me with psyllium husks. It seems to be at about 2 T. Anything beyond that and I can taste them, and I’m not a huge fan of the taste. But, I tried to sub in some flax seeds. Nope, it doesn’t work as a cake. A gooey pudding, yes. (And, honestly, the kiddo devoured that version.) But, it wasn’t a cake. If grains do not bother you, be sure to check out Iris’ version. 1. Prepare filling in a small bowl and set aside. Preheat oven to 350 degrees F and grease/flour a tube pan. 2. Mix psyllium, milk, applesauce, apple cider vinegar, and vanilla extract in a food processor. 3. Stir together flours/starches, sugar, baking soda and baking powder in a medium sized bowl. Pour into wet mixture and process until well mixed. 4. Add in coconut oil and process until completely mixed. You could swap out the applesauce with coconut yogurt and use a little nutmeg/allspice/ginger for the spicing, I’m pretty sure. Or, just leave out the spicing entirely. Yum! Go Deanna! I think that photo looks amazing! 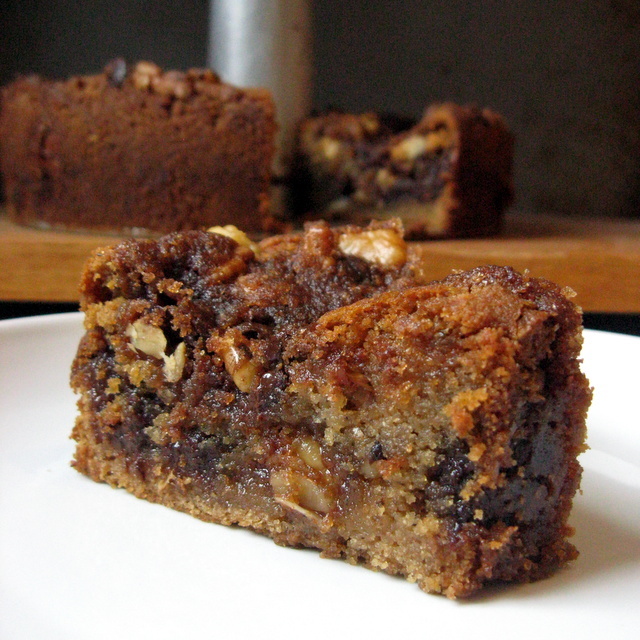 Almost like a bread pudding cake…and personally I like my baked goods more moist anyway. It’s really amazing how much it absorbs the moisture by day 2. I should have taken a second photo. But, I like it both ways. This looks amazing! Can’t wait to give it a try. Beautiful photo! What a beautifully moist looking cake, I always like my cakes extra moist instead of a texture that is more like a sponge than a sponge cake! I should have read this post BEFORE I tried to convert a 6 egg honey cake to using flax and water as eggs… AWFUL.. tried all kinds of combo and can’t seem to get one that works.. From now on, I’m just looking for tried and true vegan cake recipes .. hopefully like your coffee cake. It looks fabulous. Oh ouch! I don’t think I’ve ever had much luck with converting anything more than 2 or _maybe_ 3 egg recipes to vegan. It’s just too much of a jump. Made your cake for 4th of July breakfast. It was wonderful! Very very tasty and moist. I left the chocolate chips out because I’m not used to the concept of them being in coffee cake. Thanks so much for the recipe! I know how hard to make coconut flour goods without eggs and you totally succeeded!